On the Saturday evening there will be a Conference Dinner if you wish. This is not very formal. Our conference stresses friendship, which is why so many people return annually to us. Please advise us if you wish to have the vegetarian option, or if you have dietary needs. You can also email us at this website and we will suggest places for you once we know what you want! The conference centre is wheelchair friendly with a lift to the first floor. The Old Imperial Hotel ( linking back to the time of Bianconi, it is also called the Coach-house), on the Main Street but with parking facilities and is an award winning small hotel with superb dining facilities. The Walter Raleigh Hotel , with superb sea views, car park , on the edge of town but well within walking distance , excellent cuisine. The Quality Hotel , situated just outside Youghal , on the beach front has a range of options to consider – self catering, hotel etc. Leahy’s Guesthouse is very central, with parking and , if you mention the conference, you will get a special rate. Their website has full contact details, address, telephone etc. Aherne’s Seafood Restaurant and Hotel has been for generations Youghal’s leading eatery with many awards to its credit. Mention the conference and you will get a special rate. It has parking and a fine bar. There are two self catering options available , with websites to check out. and Harvey’s Dock ( http://www.harveysdock.com) . 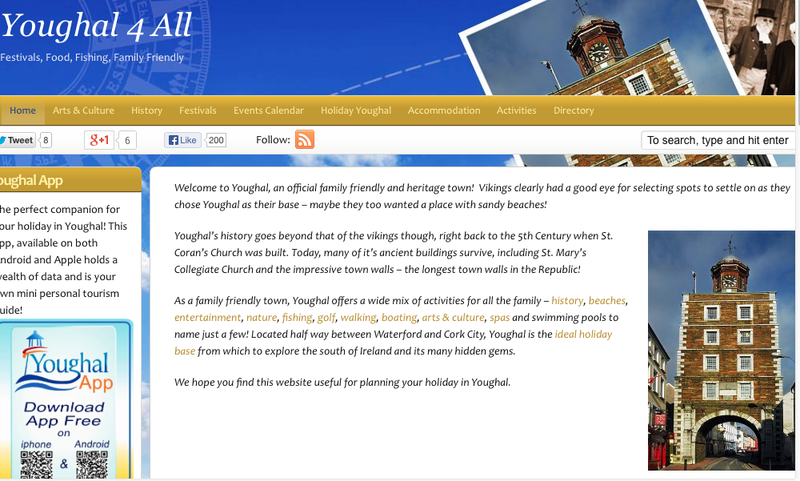 Youghal Tourist Office is a great help – right in the centre of town, near the Clock Gate. 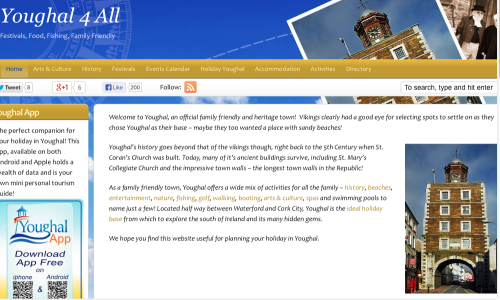 And a volunteer group of locals arrange a series of activities, festivals throughout the year – they are called Youghal 4All. Well worth checking out!